Although it is a familiar object for a billion people in the world, the four hundred year old hookah [narghile, shisha, waterpipe, hubble-bubble] seems struck by a strange silence [This article was written in 1997]. Most encyclopaedias overlook it completely, while the mass media seems to be more concerned with problems considered as "serious" and dynamic than by folkloric and inert objects. It is however undeniable that this tool is used daily, for hours on end, by over a hundred million men and women, in Asia, Europe and Africa, at the local coffee shop or at home. By opening its columns to a presentation of this object and this practice that lies at the very heart of Mediterranean conviviality, Rive magazine  deserves our gratitude for going back to the true meaning of discovery. How can one smoke like this for hours on end? For those who have never heard of the hookah [narghile, shisha, waterpipe, hubble-bubble] before, we shall briefly define it as a water pipe mainly used in the East, where its social use became widespread together with public coffee houses and tobacco. Its historical relationship with the universal stimulant is well illustrated by an Egyptian saying: "Tobacco without coffee, a sultan without furs" that some readers will no doubt associate with a popular Spanish saying, "Café, copa y puro" (a coffee, a glass and a cigar!). And if the art of smoking well, represented by the cigar, is here associated with the enjoyment of tobacco through the hookah, what is the place of a glass of wine (the copa) in this comparison? It is common knowledge that in most of the area in question alcohol is a religious taboo and is therefore replaced, in this context, by words, with an unquestionably psychoactive power, as we shall see later. The tobacco [tobamel, mu'essel] used is a relatively sweet tobacco, both because of its aromatic additives and because of the washing - the ablution, as some might put it ironically, of the smoke in the water container. This peculiar and incredibly widespread manner of smoking is now undergoing a phenomenal revival in countries such as Tunisia, Egypt and many other Middle Eastern states. The three dimensions of hookah: time, conversation, and play (ludens). 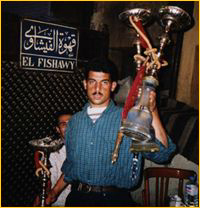 The hookah, compared with other objects of local material culture such as the brazier or the derbûkat (small drum) for instance, retains a three-fold specificity. First of all, it affects time, expanding it much as the laws of relativity do. Secondly, it is a pretext for conversation since it encourages and supports long chats, thirdly, unlike cigarettes, it is not associated with a seductive personality, but rather with a sort of game, as the smokers pass the tube around, each taking a few puffs of smoke, in turn. So, here we have adults playing like children, spending hours at it, while engaging in serious conversation, quite like Alice and the Caterpillar in Lewis Carroll's tale! But (his does no have the good fortune of pleasing certain technocrats and 'intellectuals' with an excessively positivist attitude who feel that the practice, considered by its fans as a life-style. is an obstacle to "development". This argument was recently  put forward during a vehement press campaign in Yemen led by the newspaper Al-Ayyâm, with the support of sociological questionnaires and interviews with medical specialists. In fact, this is nonsense: in a large number of countries engrossed by the burning issue of "development", anyone can see workers, peasants, technicians, engineers, doctors and top civil servants, all enjoying outside working hours - need one say this - a few delicious moments of company around a hookah [narghile, shisha, waterpipe, hubble-bubble] . In short, the aim - should there really have to be one - is not to smoke in order to appease an addiction or get rid of anxiety, as with cigarettes, but to take the time to chat and listen and share, one by one, by passing the suction tube around in a brotherly, ritual and symbolic manner. it must however be pointed out that the tendency to have television screens flooding certain coffee-houses with images, as can be seen in Amman, totally destroys this atmosphere. Since we are dealing here with Mediterranean societies,. it would not be relevant to analyse sociability in terms of the classical opposition between public and private. In fact, as Shawqi Douaihi observed about the coffee houses of Beirut, "...the closed private atmosphere of the home and the open public arena of the street are only deformed extensions of each other." The terms "conviviality" (from the Latin convivialis; "pertaining to meals ") which includes the notion of sharing and ritualised exchange, and "hospitality" with its strong domestic connotation, seem more suitable. Turkey, a country that increasingly attracts attention, is no longer the place where Pierre Loti, at the beginning of the century, could count hookahs by the thousands "How wrong the word 'coffee-house' sounds when you wish to designatethese Eastern taverns where the hookah is smoked", he once remarked. This novelist and seaman turned Eastern sensualist used to stop at such places with an assiduity rivaled only by his enthusiasm as a collector. Today, the places set up for indulging in this art, often under the horrified gaze of tourists, can be counted off the fingers of one hand. In Istanbu1's Beyazid district, there is even a coffee house that invites foreign visitors to try what the sign outside advertises as the "mystic water pipe . After all, isn't the hookah an Eastern version of the American Indian's peace pipe? Tunisia, increasingly described as an "economic success story", is also a friendly country - according to the advertisements - where the art of the farniente embodied in the shisha is very much alive; so much so that a worried government has taken dissuasive measures against the practice. This country is living proof that "economic development" Can be perfectly in tune with an "archaic custom 'indulged in by "lazy oafs"! An "art de vivre, a "life-style" ? While Europe debates a cut in working hours, as smokers andnon-smokers are divided by glass walls, as one wonders about the disintegration of social relationships, is not the importance of the hookah [narghile, shisha, waterpipe, hubble-bubble] increasingly obvious? Doesn't its exotic and poetic nature, even as it is incomprehensibly ignored, provide a comparative, anthropologically useful, overview of various societies in their forms of sociability and their perception of time?